Lock in a great price for Long Beach Chalet – rated 9.1 by recent guests! Everything about Long Beach Chalat was perfect. From the beautiful rooms, well manicured landscape, nicely kept facilities (pool, beach, cafe) and over abundance of WiFi coverage. I couldn’t have asked for a better place. I wish i could have stayed longer. Long Beach Chalet was absolute heaven on earth! We threw our plans and itineraries out the window as soon as we checked in because we knew we wanted to just enjoy the resort. The way it is set up, it is like calling you to relax unwind and do absolutely nothing. We wish we spent more days there, 4 days just is not enough. Beautiful location. The woman at the front desk was great and the breakfast staff was ALWAYS a joy to greet in the morning :) breakfast was delicious. Pool was fantastic and the rooms were very comfortable. 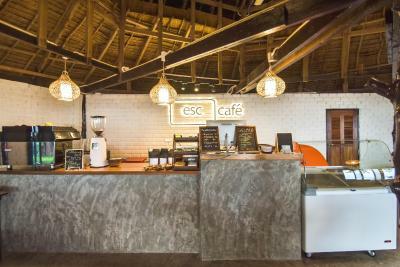 Great breakfast options including an omelette / egg station and lots of different fruit options (like mangosteen and lychee). Free shuttle to / from Sala Dan pier. We stayed in a suite near the beach and the room was very spacious and comfortable. The breakfast buffet at the hotel was excellent. Everything was amazing. The staff were so kind, helpful and welcoming. The pools and beach were fantastic. The rooms were perfect. Great location and fantastic beach. Rooms were lovely and clean. 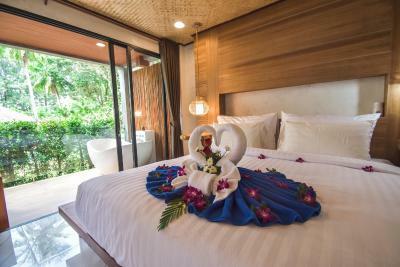 We had a seaside pavilion room which are the newest and really nice. The resort was so relaxed, you never felt anyone was on top of you. A nice selection of chairs loungers and bean bags for the beach. Staff were great and very friendly. 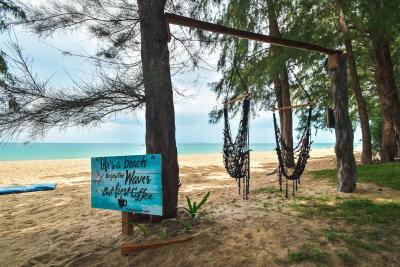 A small bit of paradise on Koh Lanta. Would definitely recommend. Very clean, friendly and beach restaurant had very good food / service. Close to other resorts along Long Beach. Beach view villa was a good decision. 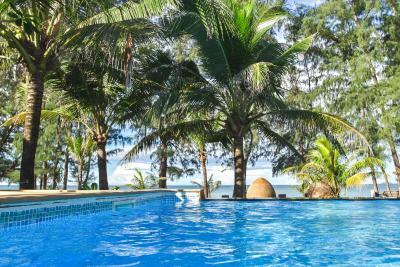 Long Beach Chalet This rating is a reflection of how the property compares to the industry standard when it comes to price, facilities and services available. It's based on a self-evaluation by the property. Use this rating to help choose your stay! 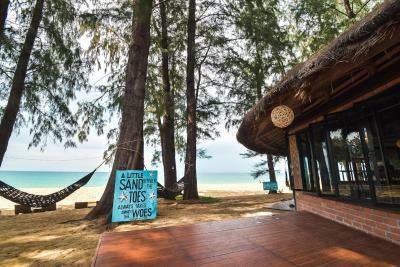 One of our top picks in Ko Lanta.Offering Thai-style bungalow and chalets set on stilts, Long Beach Chalet features accommodations where guests have options to stay either along the beach in the property's beach zone or in the property's garden zone. 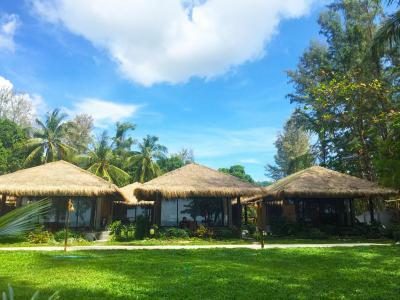 Providing free shuttle service to/from Saladan Pier, this in-the-garden property also features a saltwater swimming pool, a restaurant and free WiFi. Enjoy restful stays in spacious chalets that feature views of greenery and comfortable open-air seating on the ground floor. Each comes with a cable TV, electric kettle and fridge. 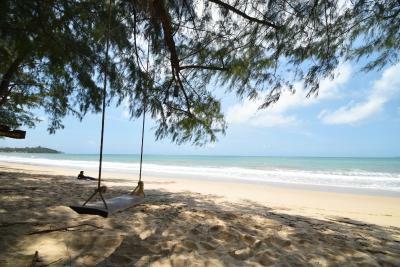 A variety of water sports and day trips can be arranged at Long Beach Chalet’s tour desk. Staff at the 24-hour front desk can also assist with transport and laundry needs. 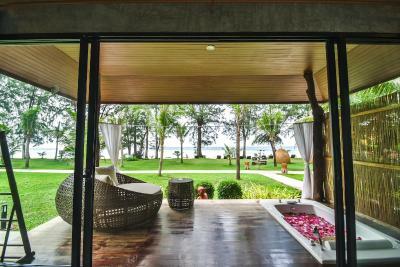 For more relaxation, guests can also opt for a soothing massage right on the beach at Treescape. 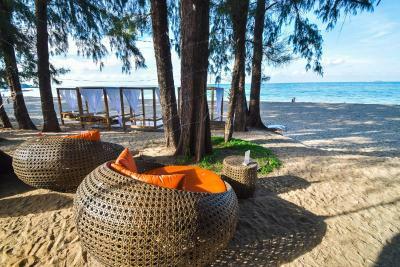 Located within a tropical landscape, the beachfront Lym's serves refreshing drinks as well as Thai and western specialties. 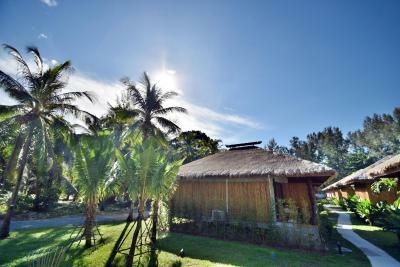 Long Beach Chalet is located 1.2 mi from Saladan Pier. When would you like to stay at Long Beach Chalet? Enjoying views of the surrounding greenery, this uniquely elevated unit is tastefully furnished with a touch of Thai essence. The bathroom is separated from the bedroom and is constructed with bamboo. 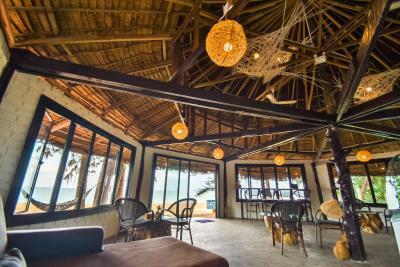 There is also a hammock and a Thai-style lounging area underneath the room. This semi-detached and elevated unit is set in the garden, directly in front of the pool and waterfall. It has a private bathroom. There is a relaxing area underneath the room within steps from the pool. Located nearer to the street, this budget elevated unit has a traditional Thai layout and décor. The bathroom is separated from the bedroom and is semi-outdoor. There is also a hammock and a lounging area underneath the room. This elevated unit features a blend of traditional Thai and modern minimal décor. The bedroom comes equipped with beanbags and a balcony. The bathroom is semi-outdoor and is separated from the bedroom. There is a lounging area underneath the room. 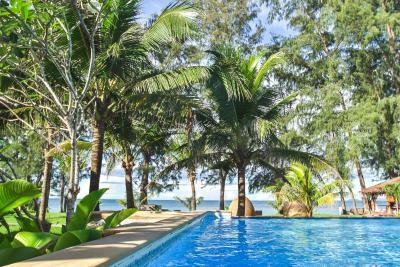 Located on the beachfront zone, 98 feet from the sand, this villa offers unobstructed sea views and the pool is nearby. It comes with an outdoor spa bath and a semi-outdoor rain shower. 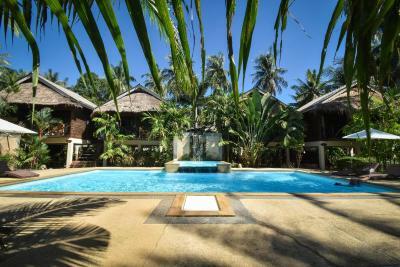 Located on the beachfront zone, 131 feet from the sand, this villa offers sea views. It comes with an outdoor spa bath and a semi-outdoor rain shower. This basic bungalow is located in the garden near the street. This small and cozy unit is a short walk from the beach, restaurant and the pool. It offers a partial sea view. 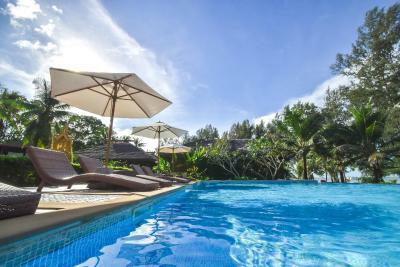 Located in the beachfront zone, the villa comes with sea views and is located close to the infinity pool. 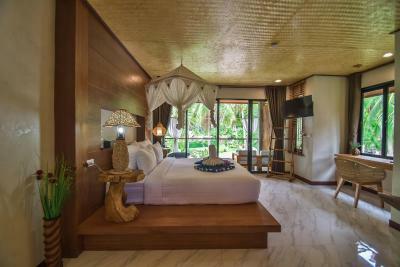 The Thai-style villas come with a spacious wooden balcony with a daybed. The bathroom is equipped with a rain shower. This twin/double room features a balcony, sofa and electric kettle. This twin/double room has a balcony, electric kettle and dining area. House Rules Long Beach Chalet takes special requests – add in the next step! Long Beach Chalet accepts these cards and reserves the right to temporarily hold an amount prior to arrival. The remaining room types are located in the property's "Garden" zone and is approximately 1,000 feet away from the beach. 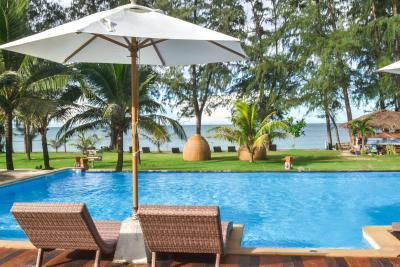 - Exceptional hotel - we upgraded to a beach chalet which was so worth it. 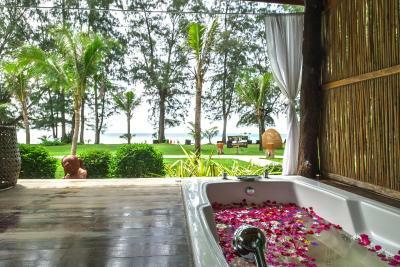 The bath / hottub in the patio was fab - Fresh drinks and fruit each day - On check-in we received cold towels and fresh juice - Free transfer to and from the hotel / ferry was really easy and quick - Rooms were INCREDIBLE. Clean, beautifully presented, air con fab, surrounding area stunning. - Beach was brilliant. Just watch for jellies, I got a wee sting - Breakfast was perfect. With the upgrade you also get free coffee between 7-10am from the coffee shop. It's beautiful coffee and can be drank on the beach - Fire show on the beach was fab - Location was a little out of town, but a short tuc-tuc down the road, or walk down the beach took you right into the heart of things. Some cracking restaurants here - be sure to go BBQ at May's Kitchen, best meal all holiday! The breakfast buffet had a lot on offer but as its outside there are a lot of flies around the food. I didnt eat any of the fruit as they were swarmed which was a shame. Beautiful grounds, amazing room and the sounds of nature around is unreal! We didn't need to leave the hotel grounds if we didnt want to as it has everything you need. We had a massage on the beach which was great, the ladies are very professional. The staff at reception let the hotel down. We were greeted on arrival with our bill - I understand we have to pay to stay but the way it was handled felt unprofessional. I always book using Booking / Agoda so dislike then being asked to pay directly at the hotel. When given a total amount and asked if we would like to pay in Baht or Pounds, I chose Baht and then I am told there is a 5% fee for paying in the local currency - this makes no sense?! We also booked an extra night at the hotel as we loved Long Beach so much - when I spoke to reception the rate they offered was worse than that online. So I booked online in front of them - again surely it makes more sense to take cash than go through Booking / Agoda?! When asked about different speed boat times from those advertised on the board in the lobby, the staff 'knew nothing about them' which was also incredibly frustrating as they are readily available online. 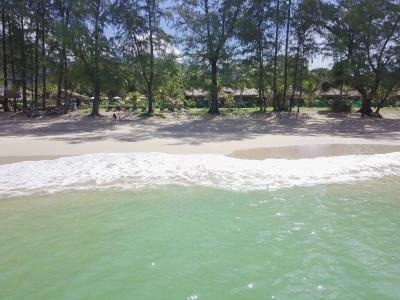 Best part about Long Beach Chalet is the location - this is a great stretch of beach in Koh Lanta and positioned near to Pangea bar for the best sunset drinks / tunes. We wanted to be close to Saladan as we were diving every day and this suited us perfectly. 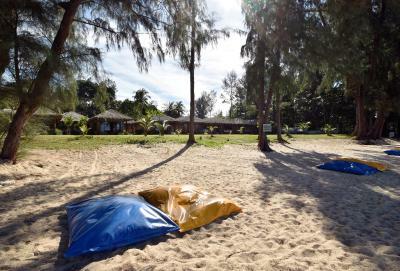 You can walk up and down and stumble upon a new restaurant or place to hang out and there are lots of beds / bean bags on the beach / by the pool so everybody can relax. We stayed in a Deluxe Seaside Pavillion Room, which is set back from the beach but with a view of the sea. 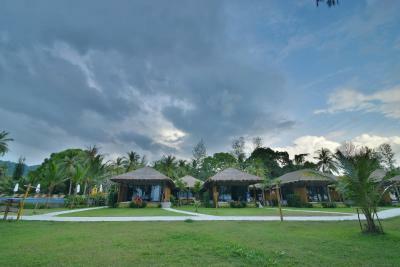 The staff in the hotel grounds / bar / massage hut are friendly and helpful. We hired a scooter through the hotel which made it easier to get around. Very long walk to the pool and beach and breakfast from the budget loft rooms - guess that’s why it’s a lot cheaper! The staff was great, very friendly and helpful. Breakfast was definitely the best we had during our Thailand trip. The rooms are big, with lots of place to store your stuff. We loved the little terrace with the beach view and the beach is perfect!! Great rooms/staff/location on the beach with everything we needed. Clean & comfortable. Good breakfast selection. Staying here made our visit to Koh Lanta very enjoyable. Fantastic beach & good beach front food. We'l be staying again. We had a garden loft room over looking the pool and it was stunning. The room was large, had a nice shower, a balcony and a very comfortable bed. It’s a 3 minute walk down to Long Beach, which is beautiful. Surrounding restaurants expensive. Breakfast at Long Beach was tasty with a good amount of choice.